In 10 years, MAINTENANT: A Journal of Contemporary Dada Writing and Art has grown from a 12-page stapled black-and-white zine to the current issue: 190 pages filled with provocative, stunning, full color art and writing by some of the most intense DADA creators working around the globe today. MAINTENANT 10 (ISBN 978-1-941110-44-7, June 2016, Three Rooms Press) includes contributions from many notable US artists and writers including Andrei Codrescu, Charles Plymell, Jerome Rothenberg, Anne Waldman, Roger Conover, S.A. Griffin, Alice Bag, Raymond Pettibon, John M. Bennett, Grant Hart and Jack Hirschman. 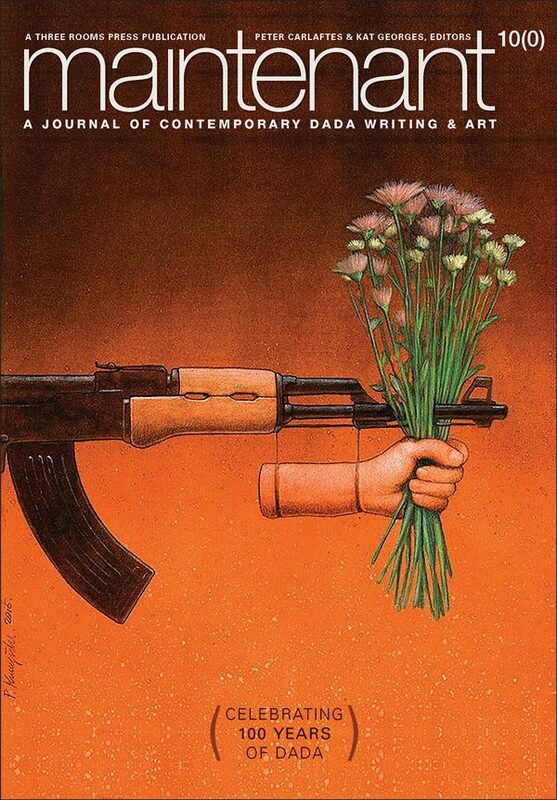 International contributors from Brazil, Argentina, Mexico, Belgium, France, Spain, Italy, Hungary, Poland, Serbia, Ukraine, Russia, Israel, Palestine, Pakistan, Nigeria, South Africa, India, Australia, Japan and more include Mark Kostabi, Fausto Grossi, Joel Hubaut, Renaat Ramon, Avelino De Araujo, Dobrica Kamperelic, Bartolomé Ferrando, Irene Caesar, and more. Working with the theme “WARM/HUNGER,” contributors examined ideas of global warming, global hunger, and the “warmongers” that lead to these conditions. MAINTENANT 10 also celebrates the 100th anniversary of the start of DADA, with quotes from DADA founders throughout the volume.